Nature's candy. 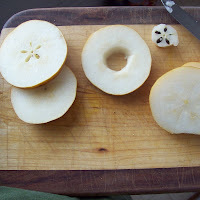 I'm borrowing a friend's dehydrator right now, she had tipped me off that dehydrated pears were just like candy. They are! So yummy. 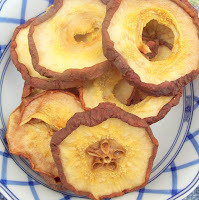 They were still chewy when I took them out of the dehydrator, the apples that I've done before were crisp, like chips. I like chewy because we don't go through them quite as fast. I keep mine in the fridge because I've had food I thought was adequately dehydrated go bad in the pantry. Dehydrated fruit is great for teething babies. And it's not nearly as messy as fresh or cooked. I cut across, then cut out the seeds only, leaving the rest of the soft core. 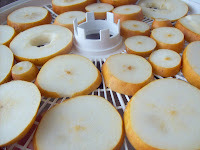 I wish I had thought to borrow the dehydrator when I got all these pears last summer! I'm just borrowing one, and I'm betting my friend bought it at a garage sale. I know that the Excalibur is supposed to be the best. I'm content with a borrowed 'Snackmaster ' for now, maybe I'll consider buying my own once we have land and fruit trees. Rose of Sharon Acres: Natural goat milk soap products and tooth soap! 0 Response to "Dehydrated Pears"